AquFlow is the gold standard in metering pumps and systems, offering the widest range of material selection and flow rates up to 1,750 GPH (Simplex) and 3,500 GPH (Duplex). The pump design has been perfected by proactively seeking customer input with the humility to acknowledge that they are the experts when it comes to their application where our pumps are used. That has resulted in a pump that never fails to live up to the expectations of the most demanding customers running the most complex processes. Our engineers have been trained to believe that the most effective ideas to improve our pumps come from listening to our customers who can be our harshest critics and our most generous admirers. We are constantly engaged in development efforts to bring the benefits of the latest developments in material or manufacturing technology. Everyone including the assemblers, testers and engineers are involved in product reviews where the ideas collected are tested for feasibility before incorporating in the final pump design. After the acquisition of the Hydroflo line of metering pumps in 2007, Precision Flow Technologies Inc. decided to re-launch the line under the AquFlow brand while preserving the original design and manufacturing processes. Even with a new name and a new look customers expect and get the same legendary dependability, durability and ruggedness of the Hydroflo chemical metering pumps. AquFlow has its roots with a company called Hydroflo Corporation. Hydroflow was established in 1972 by entrepreneur John P. Klembeth, a former design engineer for BIF and Milton Roy Company. Mr. Klembeths purpose for Hydroflo Corp. was to fill a need in the growing irrigation, fertigation, chemical, water and waste water treatment markets. Hydroflo quickly became known as a can do company because of its ability to deliver quality products promptly. This was achieved by engineering, manufacturing, assembly testing and packaging of both pumps and systems under one roof aided by Klemco Engineering Inc. also founded by Mr. Klembeth. 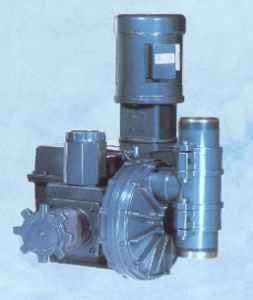 The product line initially included simplex and duplex plunger pumps featuring self adjusting packing. The line was expanded to include the Chem-Injector D line of metering pumps with capacities up to 2500 GPH and pressures to 3000 PSI along with a full line of accessories including back pressure valves, safety relief valves, calibration columns, pulsation dampeners, electronic capacity controllers and variable speed drives. By 1983 Hydroflo/Klemco had outgrown its Dublin, PA location and moved to a new 30,000 square foot facility located in Plumsteadville, PA. This became the manufacturing headquarters for the next 23 years. In 1996 John Klembeth sold the Hydroflo line to Penn Process Technologies which was run by Steve Fierce until 2000 when it went bankrupt (receivership). Nikkiso Pumps purchased the company out of bankruptcy from the bank in early 2001 and made Hydroflo a part of Nikkiso Pumps America. Nikkiso had its own line of comparable pumps and were obviously more interested in promoting those using the established sales channels of Hydroflo. In 2006 Nikkiso Pumps America decided to sell the Hydroflo line of products. Precision Flow Technologies Inc., recognizing the history of performance and impeccable reputation of this pump line was more than happy to get it. We re-launched this legendary line as Aquflow in March 2007 with a commitment and zeal not only to reclaim the old glory but to invest all the resources to make this the leading brand among chemical metering pumps. We dedicated all our resources in the beginning months to get the operations organized to achieve peak performance to meet and exceed customers expectations. When these customers started to see that we ship service parts the same day and standard pumps in 3-5 days, they acknowledged that AquFlow has added the much needed support dimension to the legacy of dependable and durable design of the pumps. The market place is also learning that AquFlow (the revitalized Hydroflo) is back and here to stay this time. With increased confidence the customers are coming back to embrace their pump of choice. In our warehouse we use the most current MRP system that enables us to track inventory very closely from the incoming inspection to shipping. We also have a process in place to conduct regular physical verifications to ensure we never run out of small parts that may delay important orders. It is because of these tools and processes we can claim to be able to ship 90% of service parts orders the same day. We can also build, test and ship standard commonly used pump models with in a week. For customization we added in-house capability to modify, develop tailor made solutions for your most complex chemical metering needs. Whether your assembly requires special machining, welding, assembly or testing we have a separate line to handle all custom projects without interrupting the regular production. Some of our customers request special testing, and verification for their certifications. We have the instrumentation to perform most of such testing and provide documentation to make the process easy for our customers. Since we can track parts from the very beginning we can easily identify the batch for every part used in the pump. This also helps us in our very stringent Quality Assurance program to prevent any problem parts from being used to build a pump. Since we handle various sizes of pumps starting from the smallest to the large 4000 series monster we have a packaging and shipping facility that can appropriately package them. From UPS boxes to wooden pallets to customized welded metal skids we can ship your pump in a durable package to endure the usual mishandling by carriers. Due to the fact that we are located near many major international airports and sea ports we have the ability to ship freight to any location in the world safely, efficiently and quickly. We have regular audits involving everyone from the line workers to the top management to ensure that not only are we conforming to the processes but also trying to improve these to make them more efficient to better support our customers. This unwavering commitment to customer satisfaction is the essence of our entire manufacturing facility.